Chapeaux el de Georgette Suzanne Talbot 1916. Home » Chapeaux el de Georgette Suzanne Talbot 1916. 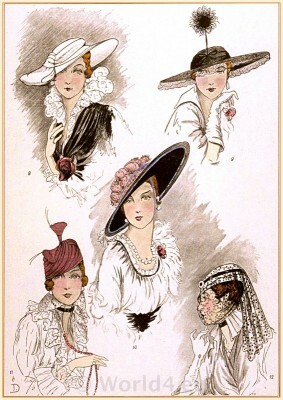 French hats fashion by Suzanne Talbot 1916. French hats fashion by Suzanne Talbot. Paris 1916. CHAPEAUX. Models de GEORGETTE el de Suzanne Talbot. LE STYLE PARISIEN, 1916. Haute couture hats fashion, Paris. French art deco period. Gallery: Chapeaux du Très Parisien. Paris hat fashion spring 1922. This entry was posted in 10s, 20th Century, Art Deco Period, France, Hat, Headdresses, Le Style Parisien and tagged Art Deco Fashion, Suzanne Talbot on 7/26/13 by world4.